The Powder River 20′ Homesteader Deluxe Alley Matches up to the Portable Sweep Tub. 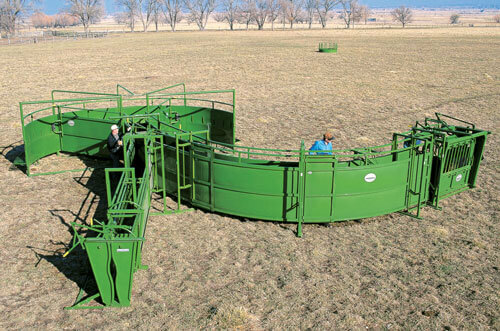 Constructed of durable 13 Gauge square tubing the system can handle calves to bulls. The open rails keep the weight down to make the system somewhat portable. It can easily be set up (or torn down) by two people in less than 45 minutes. 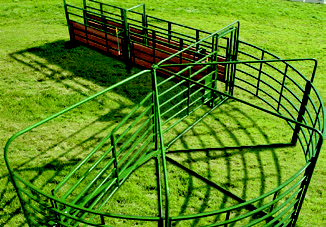 The Homesteader Working System is built for safety and is the toughest open railed system on the market today. Order the alley separately or as a package with the sweep tub. (Order# 011-00003 includes both) There are also 10′ Alley Add Sections available to lengthen your alley way. Order the 20′ alley (011-00004) separately or as a package with the sweep tub. (Order# 011-00003 includes both) There are also 10′ Alley Add Sections (011-00005)available to lengthen your alley way if desired.